The many deserts or semi-deserts and the limited wooded areas are very conspicuous and tell us much about the constant devastation during the centuries. When the country was settled about 1100 years ago, extensive areas in the interior, the mountain regions and along parts of the coastline were devoid of vegetation of natural causes. Debris laden glacial rivers, ashes and lava flows caused by eruptions, sea and wind erosion constantly affected the cover of vegetation. There was, however, a natural equilibrium, which was disturbed by the human settlement of the country. The present conditions of the country are to a considerable degree the result of this additional element. The woods were cut for fuel and housing, and the heavy grazing by the livestock added to the gradual destruction. The coarse soil eventually did not have any vegetation to hold it together and was increasingly easily eroded. About half of the land area below the 400 m level, which was without doubt covered by vegetation, is now more or less bare and only small, wooded areas still exist. Overall, however, the country has an extremely interesting phytogeographic position. The flora of Iceland comprises 470 species of indigenous and nationalized, vascular plants, including 37 species of Cryptogams, 1 Gymnosperm, nearly 290 of Dicotyledons, and 145 of Monocotyledons. About 97% of these species are found in Norway, 87% in the British Isles, and 66% in Greenland. The character of the Icelandic flora is more North European and Scandinavian than arctic. The western element of vascular plants not growing elsewhere in Europe is very small, but the eastern one is about 9 times larger (about 72). The governing element is, however, the circumpolar one. Close to half of the Icelandic species are vascular plants of boreal origin and mostly found in the conifer regions of the northern hemisphere. About one third is of arctic-alpine origin, mostly found in the treeless areas north of the Arctic Circle and mountainous areas further south. The rest is mainly coastal plants and other species with wider distribution, such as freshwater plants and weeds. The country is situated entirely south of the Arctic Circle and the climate is cold temperate and oceanic. The paucity of species is therefore not a reliable reflection of the climate and mostly due to the country’s isolation and the shortness of time since the last Pleistocene glaciation. About half of the present 470 species are regarded as survivors of the last glaciation. The families of grasses and sedges comprise about 53 species, >11% of the total number of vascular species, among them the buttercup, saxifrage, rose, pink, and daisy families are also common. The western indigenous species are commonly of special interest to European visitors. The following are the most conspicuous: The arctic fireweed or river beauty (Epilobium latifolium) with its large, purple flowers, growing on gravelly riverbanks, dry riverbeds or river gorges all over the country, but more common inland. The northern green orchid (Platanthera hyperborean) with sweet scented, greenish-white flowers, growing in meadows and moorlands in the lowlands. The broad leaved willow (Salix callicarpaea), a variable scrub all over the country. The lyngbye’s sedge (Carex lyngbyei), tall and beautiful sedge with brownish, upright-pendulous male spikes and dark brown pendulous female spikes, growing very densely in wet places. The marsh felwort (Lomatogonium rotatum) with blue flowers, growing in bogs, most common in the north. It is closely related to the gentians and is found in Arctic Russia. American visitors are usually more interested in European and Eurasian plants not found in the western hemisphere, but partially reaching as far as Western Greenland. Among them is the birch (Betula pubescens) varying from a bush to 10-12 tall trees. The rowan (Sorbus aucuparia) also varies in size, sometimes 10 m tall, and found in birch woods and gardens throughout the country. The angelica (Angelica archangelica) is common in herb slopes, moist rock-ledges or along rivers and streams, and even in bird cliffs. It reaches 1-1½ m. The wood cranes bill (Geranium sylvaticum) with its beautiful blue flowers is common in scrublands, woods, and herb-slopes. The heather (Calluna vulgaris) is one of the most common plants of lowland heaths and moorlands, except in the northwest. It is very conspicuous in late summer when it is flowering pink flowers. The thrift (Armeria maritime) is on of the most common plants in gravelly and sandy areas and has pink flowers. The moorland spotted orchid (Dactylorhiza maculata) is common in lowlands and in the lower mountain slopes mixed with grass- and herb-vegetation, sometimes in moors and shrub- and wet woodlands. It has pink-lilac flowers with numerous red dots and usually dark spots on the leaves. Approximately half of the Icelandic species of vascular plants is common in most parts of the country, in both the lowlands and the mountains. A considerable number of species has a restricted distribution and only occur within more or less limited areas, sometimes specific for them. The floristic difference between the various parts of the country is, however, not as big as might be expected considering the landscapes and climate, especially the precipitation. The harebell (Campanula rotundifolia) is one of them with its conspicuous blue flowers from middle to late summer, and the arctic poppy (Papaver radicatum), commonly found in gravelly and stony soils in the northwest, mainly in hills and mountains. 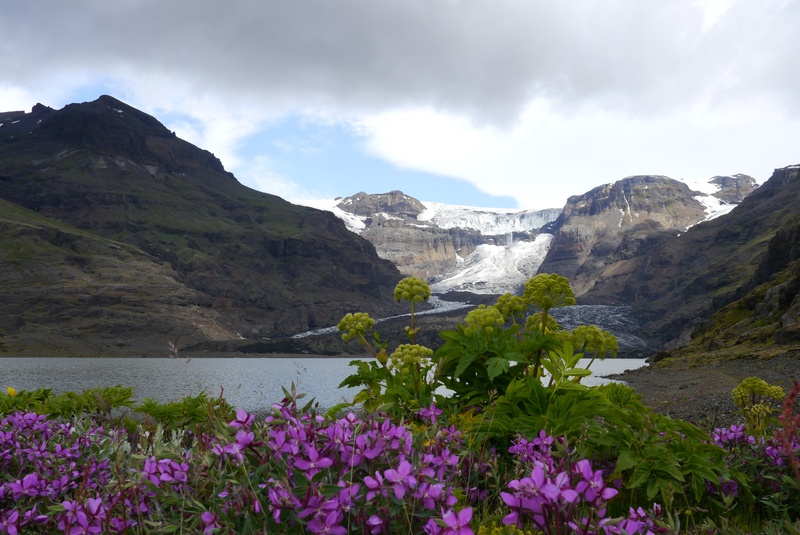 In the north, there are several arctic-alpine species not found elsewhere, such as the foliolose saxifrage (Saxifraga foliolosa), the mountain heath (Phyllodoce coerulea), and the upright primrose (Primula stricta). Some species are only found in the south, such as the ragged robin (Lychnis floscuculi), the devil’s-bit scabious (Succisa pratensis), and the valerian (Valeriana officinalis). The bryophyte flora comprises about 500 species. It is more temperate than arctic, at least in certain parts of the country. The woolly fringe moss (Rhacomitrium lanuginosum) is extremely common in lava fields and gravelly and stony areas. The sword moss (Bryoxiphium norvegicum) is one of the most interesting plants of the country, but does not grow in Norway as the name might suggest. Its Icelandic habitat is mainly on Lake Kleifarvatn in the southwest and has a curious distribution. Outside Iceland, it is found in Northeast Greenland, North America, Mexico, and the Orient. Macro lichens count about 200 species and about 300 species of micro lichens have been found. Most of the macro lichen flora is of Scandinavian character. In the ocean around the country more than 230 benthic algae have been discovered, and about 40% of them belong to the red algae, 31% to the brown, and 29 to the green. About half of them are known all around the country. A considerable number of arctic and sub arctic species are restricted to the north and northeastern coasts, and more southerly species in the south. Geothermal areas offer favourable conditions to several species of plants. Some species and subspecies of others are solely found in such places and many additional ones thrive exceptionally well and grow to unusual sizes. The adder’s tongue (Ophioglossum azoricum), the red shank (Polygonum persicaria), the marsh pennywort (hydrocotyle vulgaris), the water speedwell (Veronica anagallis-aquatica), and the marsh cudweed (Gnaphalium uliginosum) are only found growing in warm soils and water.